The 2018 John Deere Classic Chairman’s Dinner celebrated and honored individuals who are making a lasting impression in their communities. When Hurricane Harvey struck his community, Willie Rios didn't even think twice to lend a helping hand to those he could reach. 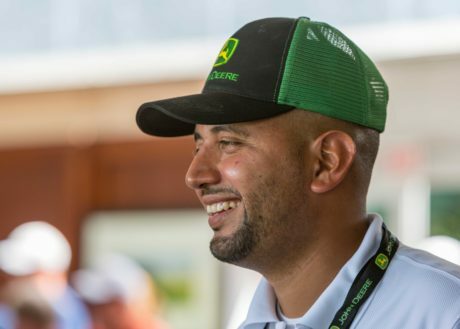 Willie Rios spent time with John Deere employees and dealers at the 2018 John Deere Classic PGA golf tournament. Willie Rios knew something was wrong. The torrential rain from Hurricane Harvey – now falling on his hometown of South Houston, Texas – wouldn’t stop. And what began with a few puddles quickly filled his neighborhood with three to four feet of fast-flowing floodwater. 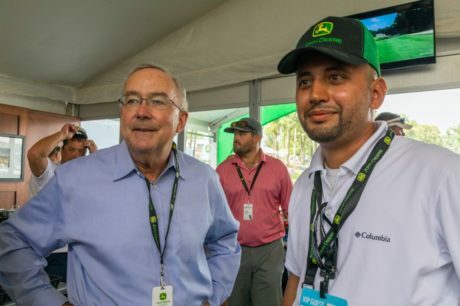 John Deere CEO and Chairman Sam Allen visits with Willie Rios at the John Deere Classic. That night in August 2017 Rios jumped on his John Deere 5-Series Tractor and set out rescuing his stranded neighbors, house by house, saving more than 250 people. 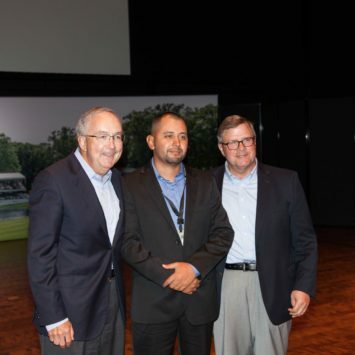 John Deere honored Rios for his lifesaving efforts at the 2018 John Deere Classic Chairman’s Dinner on July 13. Neil Behnke, a volunteer from Black Forest, Colorado, was also recognized at the event as the grand prize winner of the second annual John Deere “Small Machines. Big Impact” contest. Willie Rios with the key to a new 5E Series Tractor. 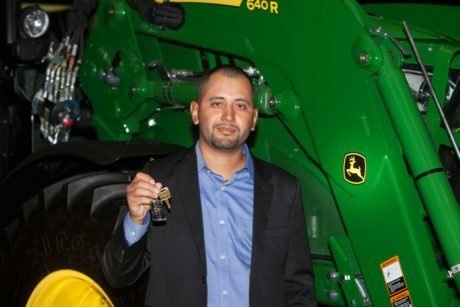 Field then presented Rios with a gold key to a brand new 5E-Series Tractor on behalf of John Deere. Hurricane Harvey hero, Willie Rios, and "Small Machines. 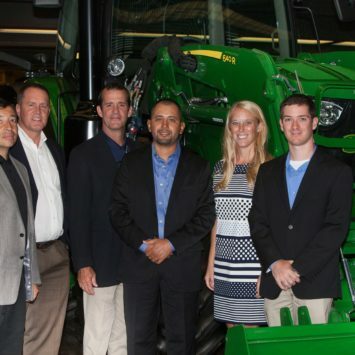 Big Impact" winner, Neil Behnke, and finalists, Kobus Appelgrijn and Anita Will are recognized at the 2018 John Deere Classic Chairman’s Dinner. 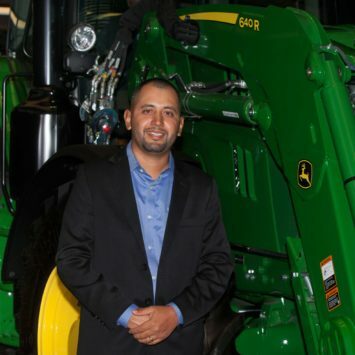 Willie Rios of South Houston, Texas, was honored at the 2018 John Deere Classic Chairman's Dinner. Texas in the house :(Left – Right) Omar Lopez, Brookside Equipment Sales, Walt Butler, John Deere territory customer support manager, (Ag & Turf), Kirk Boudreaux, Willie Rios, Laurel Caes, territory sales manager, (Ag & Turf), and Neil Miller, John Deere territory customer support manager (C&F). (Left-Right) Willie Rios with "Small Machines. Big Impact" contest participants: Neil Behnke, Kobus Appelgrijn and Anita Will. Chairman and CEO Sam Allen and Jim Field, President, Ag & Turf Division, congratulate Willie Rios. 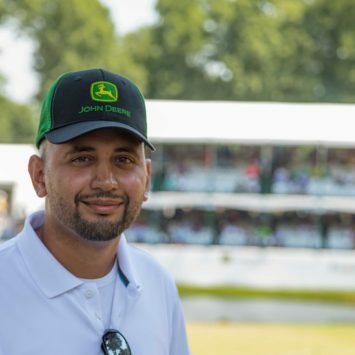 Willie Rios at the 2018 John Deere Classic. Neil Behnke of Black Forest, Colorado, is the winner of the Construction & Forestry's Division's second annual "Small Machines. Big Impact." competition. 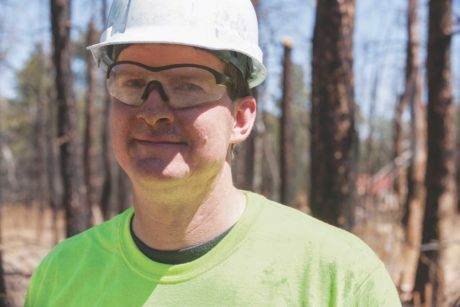 Behnke’s project helps residents of Black Forest, Colorado, clear their land of dead, dangerous trees, resulting from the most destructive fire in Colorado’s history. The June 11, 2013, fire spread across 14,000 acres in 10 days, destroying more than 50 homes, causing $85 million in damage and claiming lives. 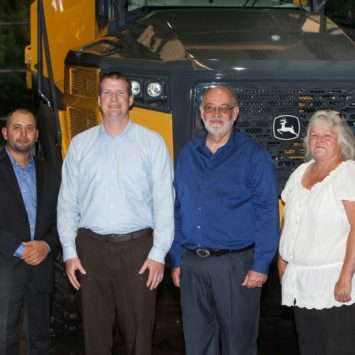 Thorne announced that, because of the overwhelming response to the contest, John Deere will help the two runners-up finalists in completing their community projects with a yearlong lease on a skid steer or CTL from John Deere Financial. Runners-up finalists Kobus Appelgrijn of New Port Richey, Florida, and Anita Will of Ridgefield, Washington, were also recognized. Through West Pasco Habitat for Humanity, Appelgrijn’s project, “Restoring Neighborhood Pride,” uses the help of over 50 volunteers to revitalize 40 badly deteriorating homes to help create a thriving community. Will’s project, “Trailblazing Outdoor Connections,” is transforming Whipple Creek Regional Park from a dilapidated area into a community staple, with over 8,000 volunteer hours donated since restoration began in 2011, growing annual visits from 1,000 to 54,000. Additionally, all three finalists will receive a $2,000 stipend to help in the completion of their projects, donated by John Deere and their local dealers. Thorne said the contest received over 370 entries. John Deere selected three finalists based on the potential impact of the project on their local community, how much the machine would be used to enhance the project and alignment with one of these John Deere Corporate Citizenship priorities: improve food security, education, or community development. Online and text voting was then opened to the public from June 4 to June 24 to help choose which of the finalists’ community projects would come to life.